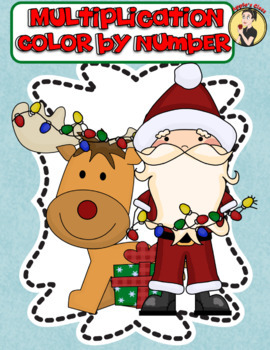 These Christmas Santa themed color by number multi-digit multiplication practice worksheets are rigorous enough for classwork, homework, or enrichment, yet fun. Perfect for 5th grade but suitable for 4th and 6th as well. 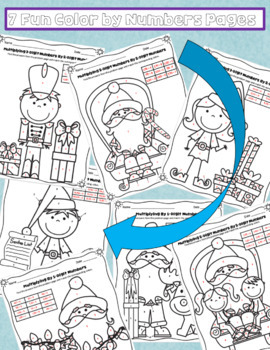 Add to lesson plans as an engaging way to practice these important skills during the holiday down time. 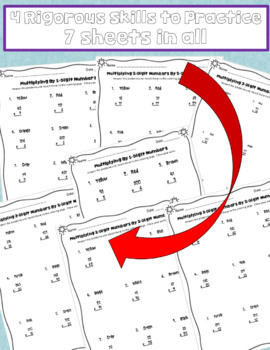 Includes anchor chart printables that can be enlarged and posted on your classroom walls or kept small and added to student notes. 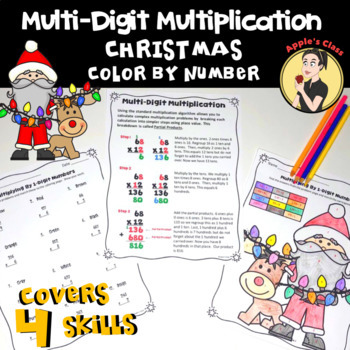 This worksheet set focuses on partial products and the standard algorithm for solving multi-digit multiplication problems making teaching easier and learning fun. Simple to align with 5th or 6th-grade common core education standards. Click Here To Follow Me and Be First to Know When Sales Are Coming! If you have questions or problems please contact me through product Q & A so I can help.